Family and friends join Scott Browning (left), who received the papal honor Knight in the Order of St. Gregory the Great, Jan. 21 at the Cathedral Basilica of SS. Peter and Paul. Probably most people in Philadelphia connect Sunday, Jan. 21 as the date the Philadelphia Eagles clinched the NFC championship as a prelude to playing in the Super Bowl. For Catholic Philadelphia the day was especially important for quite another reason. Earlier in the day 28 mostly lay men and women and some consecrated religious formally received honors bestowed upon them by Pope Francis for exceptional service to the Archdiocese of Philadelphia. 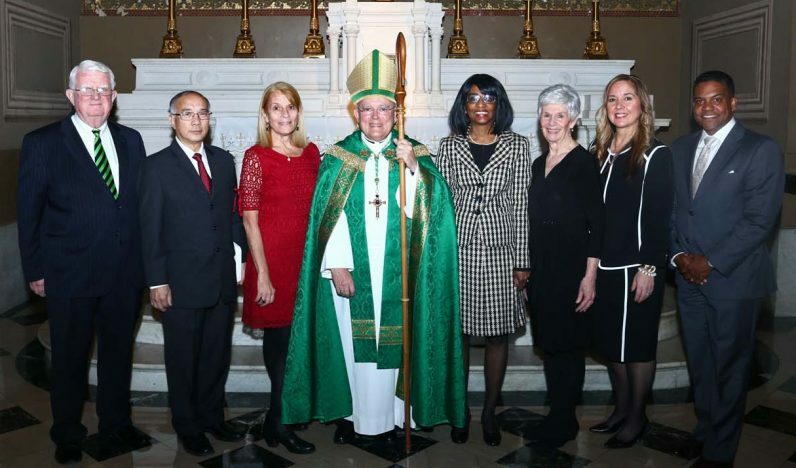 Archbishop Charles J. Chaput, who conferred the honors during a Vespers service attended by many of the friends and relatives of the honorees, took note of the convergence of the two events. “We know that what’s happening here is the celebration of God’s goodness as shown in the lives of our brothers and sisters is more important,” he said. Three classes of honors were bestowed. Nine were named Dame or Knight in the Order of St. Gregory, 11 received the Cross Pro Ecclesia et Pontifice (Cross of the Church and the Pontiff) and eight received the Benemerenti (To a Well Deserved Person) medal. Anne Healy Ayella, who worked for many years with archdiocesan Nutritional Development Services, accepts the Benemerenti Medal from Archbishop Chaput. One award was especially poignant. It was the Cross Pro Ecclesia et Pontifice to Permanent Deacon Manuel Beltran, who died four days before the ceremony. is med was His award was accepted on his behalf by his wife, Becky Espanol, who also received the same honor. Comments from honorees after the ceremony was strikingly similar. Joseph Sweeney, a 31-year archdiocesan employee and former secretary for Catholic Human Services who is now retired, was named a Knight of St. Gregory. Arthur Burke, who was named a Knight of St. Gregory, and his wife Mary Anne who was named a Dame of St. Gregory, both were honored for their longtime work of promoting religious vocations with the Serra Club of Philadelphia. 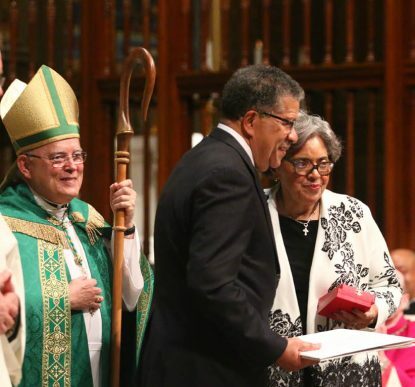 Deacon Jose Lozado, a permanent deacon at St. Veronica Parish and the community at the former St. Hugh Parish, received the Cross Pro Ecclesia et Pontifice. “It’s great,” he said. “It’s the ultimate (honor), receiving this from the pope,” he said. 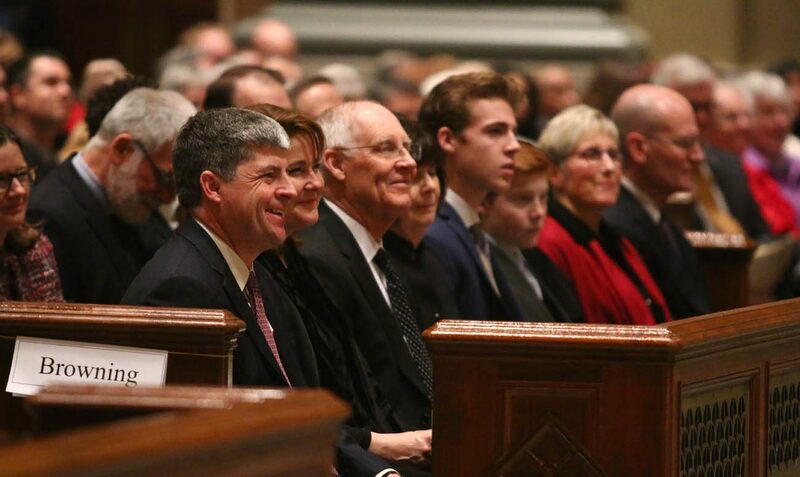 Brother Richard Kestler, a Christian Brother who spent his career as a teacher and administrator most notably at West Catholic Preparatory High School, also received the Cross Pro Ecclesia et Pontifice. Gerald and Anna Davis receive the honors Knight and Dame in the Order of St. Gregory the Great from Archbishop Chaput. 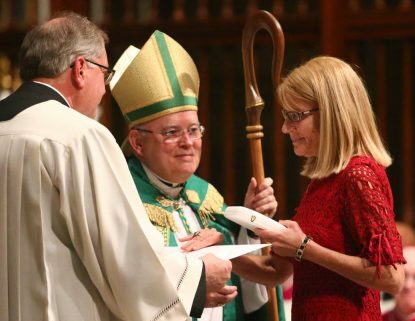 Donna McCloskey was named a Dame of the Order of St. Gregory for her work in support of Catholic education, and she was also thrilled and humbled by the award. At this ceremony, Matt, who previously was named a Knight of St. Gregory, received the Cross Pro Ecclesia et Pontifice. “Whatever we did it was a combined effort,” he said. A few minutes after the ceremony ended, he had already shed his jacket and tie and switched to Eagles regalia to head down to Lincoln Financial Field for the big game that evening. But God came first. Recipients of the Benemerenti Medal pose after the Jan. 21 ceremony with Archbishop Chaput.